Starwood Preferred Guest has launched a new promotion for Delta Air Lines SkyMiles member stays in the United States & Canada between April 1 – June 30, 2016. 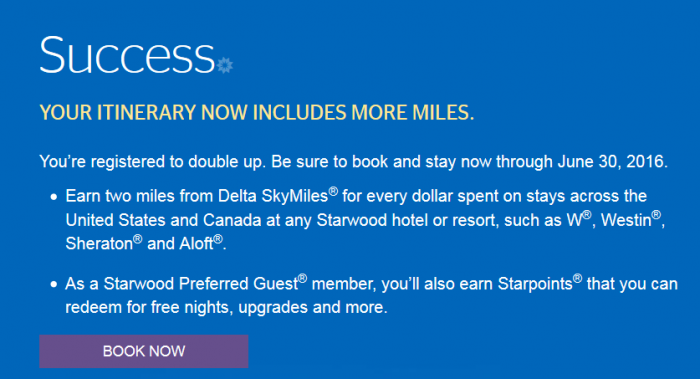 SkyMiles members can earn 2 miles per USD charges in addition to their usual Starpoints and Delta Elite’s that have signed up for the Crossover Rewards (read here) earn this additional bonus. You can register for this offer on Starwood’s website here. Note that you only need to sign up for this offer and link your Delta SkyMiles frequent lfier number to your SPG account. The miles earner under this promotion are in addition to the Starpoints and all other promotional points that you earn for the stays. You don’t have to change your earning preference from Starpoints to airline miles. This is great offer for those that travel in North Americas, as these Delta miles are just a bonus in addition to the all other promotional offers that Starwood currently has going on. Registration: SPG® and Delta SkyMiles® Members must register online at spg.com/doubleup by 11:59 p.m. Eastern Time (ET) on June 24, 2016. Registered Members can earn two (2) Delta miles for each one (1) eligible dollar spent at any participating Starwood hotel or resort in US or Canada (excluding Puerto Rico and US territories) for each eligible stay of one or more eligible nights between April 1 and June 30, 2016 (the “Promotion Period”). Registered Delta SkyMiles Member must be an active SPG member. Delta SkyMiles Member must enter their Delta SkyMiles number during the registration process to receive miles. SPG Member account name must match the name on the member’s Delta SkyMiles member account. By registering for this promotion, the SPG.com profile associated with the SPG member will be updated to include the Delta Skymiles number provided. Individuals may register for an SPG Member account for free at spg.com, and may register for a Delta SkyMiles account for free at delta.com/enroll, respectively. Earning: Registered SPG Members will earn double miles on eligible stays of one or more night(s) between April 1 and June 30, 2016, at any SPG-participating Starwood hotel or resort. Members are eligible to earn Starpoints as they normally would for their eligible Starwood hotel and resort stays in addition to the two (2) Delta miles for each one (1) eligible dollar spent during an eligible stay of one or more nights during this Promotion Period. There is no limit on the number of bonus miles that can be earned during the Promotion Period. 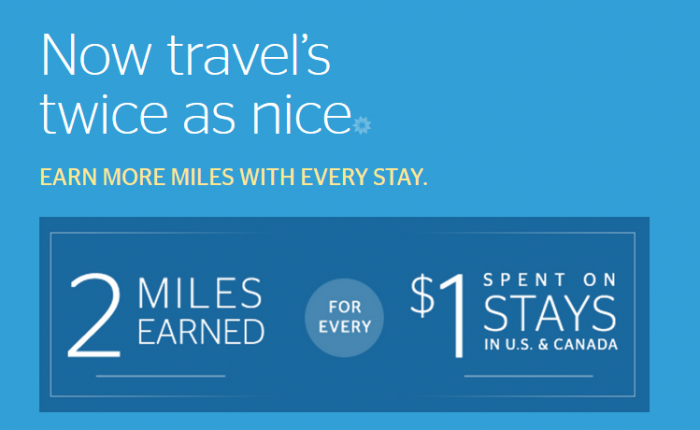 Unless specified, bonus miles earned through this promotion do not count toward elite-status qualification or elite status. Bonusing: Double miles will post to the registered Member’s account within 4-6 weeks after the qualifying stay posts. Eligible stays and nights: An eligible stay is defined as one or more night(s) in a participating Starwood hotel or resort in US or Canada (excluding Puerto Rico and US territories) paying an eligible rate and posting to the Member’s Starwood Preferred Guest® account. An eligible night is defined as at least one night paying an eligible rate in the Promotion Period. An eligible rate is any rate that is eligible to earn Starpoints in the Starwood Preferred Guest program. A listing of SPG-participating hotels and resorts and a description of eligible stays and eligible rates can be found at spg.com under the program terms and conditions. See Section 2.1 for the complete definition of eligible rates. Note that certain prepaid room reservations, such as when the booking is made through a third party — including but not limited to travelocity.com, expedia.com, orbitz.com and delta.com — are not considered eligible rates and do not earn Starpoints or qualify for promotional earnings. Stays must be booked through any Starpoints-eligible channel, which includes a travel professional who books through those channels or the GDS. All promotions are subject to the Starwood Preferred Guest program terms and conditions, which are subject to change without notice and can be found at spg.com. Offer is applicable to individual Members only and not to groups. Not responsible for omissions or typographical errors. Starwood reserves the right to discontinue this offer at any time. To update your communication preferences or learn about our privacy practices, view our Privacy Statement at spg.com/privacy, or access our privacy information line by calling 1-877-782-0071 in the U.S. and Canada or +353-21-4930474 in all other countries. Starpoints, SPG, Preferred Guest, Sheraton, Westin, St. Regis, The Luxury Collection, W, Le Méridien, Tribute Portfolio, Element, Aloft, Design Hotels, Four Points and their respective logos are the trademarks of Starwood Hotels & Resorts Worldwide, Inc., or its affiliates. Void where prohibited by law. SkyMiles and Medallion are registered trademarks of Delta Air Lines, Inc. SkyMiles partner offers subject to the terms and conditions of each individual offer. Previous articleAIr India Pilot Refuses To Fly Without His Favorite Female Co-Pilot – Passengers Stranded!